Thank you Tilda for our lovely artwork. We really treasure the Dear Hope Street art project. What a great idea! And we got one of the best artworks. We received on many years ago from Mia in Melbourne (Artworks series) and we still have it here. We will have to frame them and Hope that one day we will receive another one. 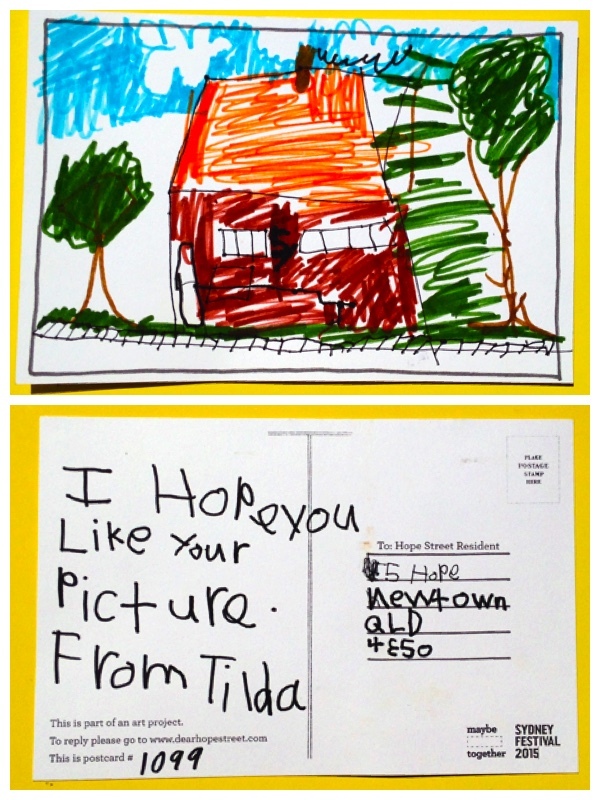 I really like the colours you used in your drawing, they are very like the colour of our house in real life. I like that you have put so many trees around our house – we really try to fill our garden with trees to attract the birds. When we tell people where we live, we like to tell them that “we live in Hope”. Thank you again. My husband will probably want to write a thank you note when he gets home from work this afternoon also. Thank you for your letter, it made me happy.